Don't apply any waxes or polishes before applying the paint. 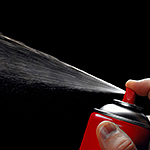 This can affect the finish, and it can also affect how well the paint adheres to the vehicle. Hang on to your touch up paint container. You'll want information on the color code, brand, etc.